Jaguar had a well-established reputation for building beautiful, powerful, and luxurious sedans (saloons, to the Brits) that dated back to the 1930s, with their MG SA-fighting S.S. Jaguar 1 1/2 Litre, 2 1/2 Litre, and 3 1/2 Litre Saloons. Their traditional body styles would carry over into the postwar period, ultimately replaced by the XK DOHC six-cylinder-powered, XK120 styling-inspired Mk VII of 1951. The large Jaguar saloons would evolve through the Mk IX and E-type-engined Mk X/420G, while a smaller saloon line descended from unit-body 2.4 of 1956 to the famous (and sometimes infamous!) Mk II. The S-type would be the in-betweener that, after a few years, begat the 420. This three-way split lineup of sedans was still being offered in 1967, when we could buy a Mk II/340, 420, or 420G. 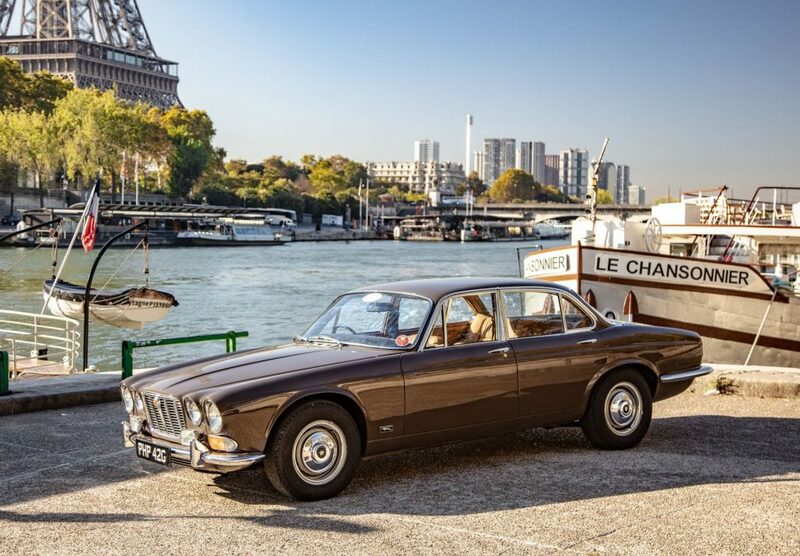 That would prove the end of the line in America for that trio, as Jaguar had something new and exciting in store for 1968: the XJ6. ‘PHP 42G,’ a 1968 XJ6 belonging to Jaguar Heritage Trust, was originally run by Jaguar founder and chairman, Sir William Lyons. 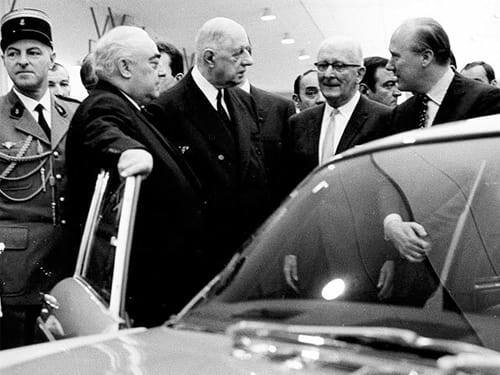 As Heiner Stertkamp’s excellent Jaguar: The Complete Story explains, the concept behind the new XJ saloon arose out of the 1961 U.S. introduction of the E-type, when Sir William Lyons asked his engineers, led by Bill Heynes, to build a larger, four-seat version of the coupe. The initial result was actually two four-doors, one of which was intended for America, had E-type-derived styling, a wide track, and the 5.3-liter V-12 engine under development; the second had a more squared-off design, a narrower track for European markets, and could be powered by a six- or 12-cylinder engine. A V-8 displacing 3.5 liters, also intended for this new sedan, was an offshoot of the V-12 program, but its 60-degree banks and lack of balance shafts made it unsuitable for production. From those exercises, one luxury sport sedan would emerge. The XJ’s styling was finalized in 1966, with bodies to be made by Pressed Steel Fisher. This model would ultimately cost about £6 million to bring to market, and would be shown at London’s Royal Lancaster Hotel on September 26, 1968, before making its official debut a few days later at the Paris Motor Show. 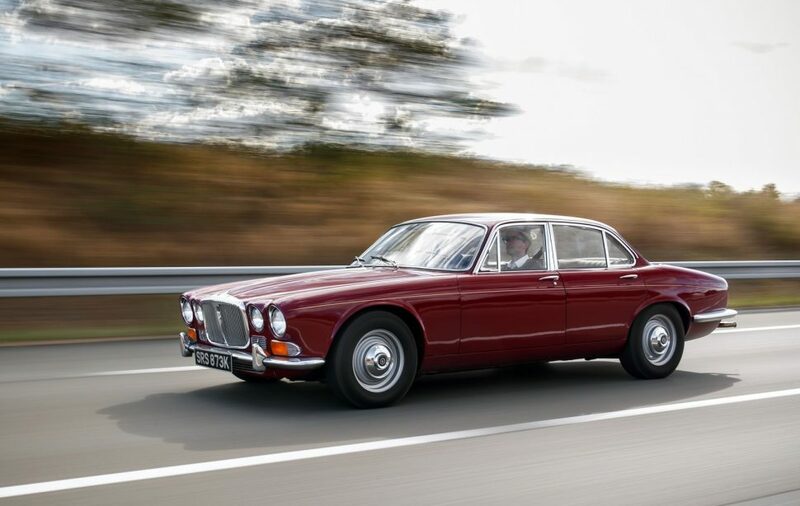 As it appeared, the XJ6 was powered by the twin SU-carbureted 246-hp, 4.2-liter DOHC six mated to a three-speed Borg-Warner automatic, or for certain European markets, a 180-hp 2.8-liter version coupled with a four-speed manual. In 4.2/automatic form, this sedan could reach 60 mph in a swift-for-the-day 8.8 seconds, and a top speed of 124 mph. Americans wouldn’t start getting their examples until late 1969, and as overseas, they were immediately popular, leading to long waits for buyers. The V-12-powered XJ sedan would finally reach production in 1972, dubbed “XJ12” wearing Jaguar badges, or “Double-Six,” as a fluted-grille Daimler, and it would offer near-150 mph potential. Just under 100,000 Series I XJs would be built in six- and 12-cylinder, Jaguar and Daimler forms, through September 1973. As Martin Buckley wrote of this car, “With its familiar XK powerplant, fully independent suspension and traditional furnishing, there didn’t appear to be anything especially radical or new about the XJ as a cold specification or a marketing proposal – at first glance, anyway. The magic was wrought in the way that Jaguar refined and developed all the systems that it knew worked into a new, svelte and more crash-worthy four-door saloon body that was both lighter and stronger than before.” It was, indeed, a deft, elegant blending of art and machine that would define Jaguar luxury sedans for decades to come. The original XJ would gain a long wheelbase variant towards the end of Series I production, and the Series II, built from 1974 through 1979, would include a beautiful, short-lived two-door hardtop coupe in XJ6C and XC12C forms. The Series III XJ of 1980-1987 sported styling refined by Pininfarina of Italy, while the fourth-generation “XJ40” models would take the XJ from 1986 through 1993. The “XJ300” series of 1994-1997 would be followed by the similar looking, but V-8-powered XJ308, from 1997 to 2002. While the seventh generation XJ — for the second time badged XJ8 (“X350”-“X358”) and built through 2009 — retained traditional styling cues, those cues were realized in an all-aluminum body shell similar to that of the German competitor Audi A8. Jaguar Director of Design Ian Callum signed off on the current XJ (“X351”), which debuted for 2010, and was the first to abandon the time-honored Jaguar sedan lines, rather, loosely interpreting the original car’s spirit in a very sleek and modern form. 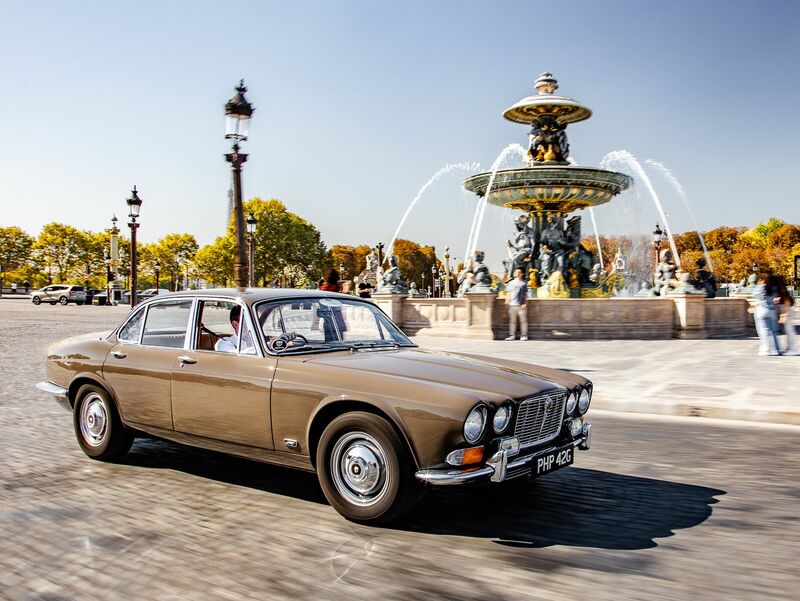 Jaguar chose to celebrate the XJ6’s golden anniversary by driving examples of each generation of XJ from its Castle Bromwich plant in England to Paris, France, stopping at locations key to Jaguar and XJ history like the Goodwood Motor Circuit and Le Mans, before mounting a special display at the 2018 Motor Show. There, the Series I was shown with the anniversary-themed XJ50. The automaker has produced a highlight reel of 50 years of XJ design changes, which can be seen below. Have you ever motored in an XJ? Leave a comment telling us which is your favorite generation, model, and engine.